With 11 years of teaching experience, Claire’s diverse musical studies, travels, and innate passion for teaching have led her to have a dynamic and holistic approach as a music educator. Claire enjoys teaching children and adults, and she lives and breathes the Suzuki philosophy that “every child can”, and takes it one step further, believing that “every person can”. Claire believes that music, being truly universal, is an integral part of the human experience, and that everyone should have an equal opportunity to learn and love music. She strives to share her love of music with her students, and to nurture and cultivate their artist within. A native of Cincinnati Ohio, Claire Timmerman recently returned home after several years of residence and music studies in Paris, France. 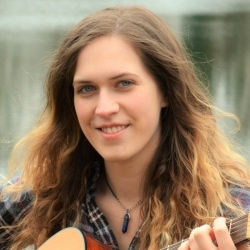 Claire was born into a musical family where her passion for music was nurtured from a very young age. Her parents, both Suzuki teachers, studied in Japan under the direct tutelage of Dr. Suzuki. At the age of 2, Claire started playing the violin using the Suzuki method, and started cello shortly thereafter. By her late teens, she began her Suzuki teacher training and taught at her first Suzuki workshop in St. Petersburg, FL. Soon thereafter, she was being invited to teach Hip-Hop and Jazz violin courses at different workshops and group classes in the midwest. In 2008, Claire began teaching violin, cello and guitar at the Peaslee Neighborhood Center in Over-the-Rhine with underprivileged students. There she taught classical, hip-hop, jazz and blues, in a curriculum designed by herself and her colleagues and heavily influenced by Suzuki Method principles. Her innovative teaching approach further inspired her to create and teach a music curriculum in a math tutoring program at Mr. K’s Enrichment College Consortium beginning in 2009. Claire attended SCPA in Cincinnati, Ohio, and later graduated from Interlochen Arts Academy, in Michigan, where she majored in violin performance. She then majored in Music Therapy with a minor in Cello Performance at the University of Dayton. In 2009, Claire took residence in Paris, France, where she studied Jazz at Paris VIII Université and began touring internationally as an independent singer-songwriter, performing her original work at some of Europe’s acclaimed festivals and venues. Claire released her first album of original works entitled “Between Worlds” in the spring of 2013.